I have been building Web sites for small local businesses for several years. My work has won me several awards. I specialize in Web sites for small business and local non-profits. 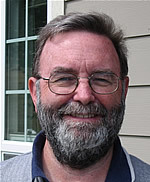 I built the original Anacortes American Web site in 1998 and maintained it until the start of 2003. The publisher, the Skagit Valley Publishing Co, has taken over that site. I designed the Lincoln Theatre Web site in 1998 and maintained it until mid-2002, when the theater moved it in-house. My background includes work as a user-interface designer at Etera Corporation in Burlington. My work at Etera was a bit of a homecoming, as I designed the original Web site for their predecessor, Summersun Perennials. I have also worked as a Web producer for seniorcenter.com, a La Conner-based Web site aimed at seniors. I left there when funding ran out. Previously, I worked as a customer support representative for Sun Healthcare Systems, based in Anacortes. My professional background includes 3 years doing support for NewsMaker television & radio newsroom software by NewsMaker Systems, based in Agoura Hills, Calif., and more than 20 years as a radio and television reporter, writer & editor in Los Angeles and Honolulu. In Los Angeles, I worked as a news editor/producer at KFWB all-news radio. My work included creating a new newscast rundown every 20 minutes (Give us 22 minutes, we'll give you the world apparently rhymed better), assigning morning-drive stories, supervising morning-drive staff and making sure the stories got on the air the way I wanted. I picked up several awards during my tenure at KFWB. And, the morning ratings went up, too. I worked 15 years in Honolulu as a reporter/newsroom manager/assignment editor for KHVH, another all-news radio station. It was wonderful living and working in Hawaii. During the course of my years there, I also was a stringer for Voice of America and I did weekend reporting for two television stations (KHON & KGMB). As a freelance technical writer, I created and built the help system for Money Tree, a personal finance program for OS/2. I also designed and wrote the WinHelp documentation for WinCIS (also known as GoCIS), an offline reader for CompuServe users. Neither program sold well and both have disappeared. Four years in the Air Force working in radio & television: first in a TV studio at Andrews AFB, near Washington, DC; then in a newsroom at American Forces Korea Network in Seoul, Korea; and finally in a PR shop at Travis AFB, between Sacramento & San Francisco.